I did not watch a newly released film this week. Instead, I watched Eighth Grade, an adorable comedy released back in August of 2018 (which first premiered at Sundance) and now available through your personal movie streaming or delivery service. 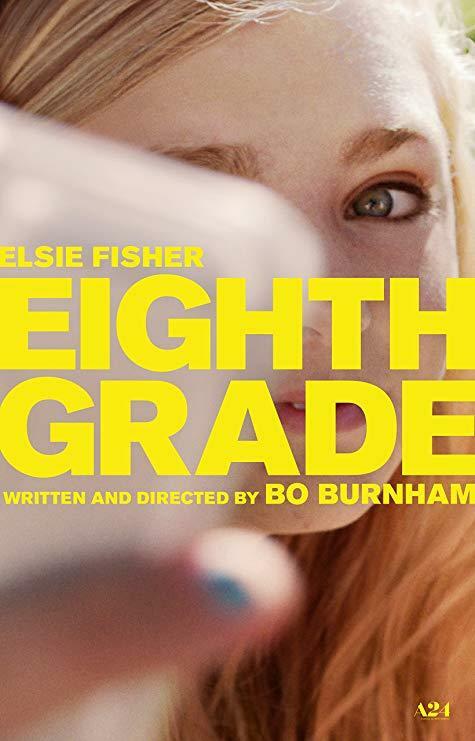 Eighth Grade follows the ordinary life of Kayla (Elsie Fisher, Despicable Me 2, 2013), a 13-year-old desperate to make friends, avoid her embarrassing dad, get more subscribers to her YouTube channel, and finish her last days in eighth grade without disgrace. A coming-of-age film hasn't been this genuine, this funny, or this relatable in a long time. Now we know lots of other great, teenager, coming-of-age films like Dazed and Confused (1993), Almost Famous (2000), Juno (2007), The Way Way Back (2013), and The Edge of Seventeen (2016). But what sets Eighth Grade apart is how it shows the addictive, pedagogical influence of the internet on children's impressionable lives and how social media is such a huge part in shaping the identity of every teenager (especially teenagers struggling with acne, braces, or anxiety). Eighth Grade is written and directed by out-of-the-blue visionary Bo Burnham, a 28-year-old comedian from Massachusetts. Eighth Grade is his first time directing a full-length feature film. He gives us such an awkward, endearing, lonely glimpse into the life of a contemporary teenager. I can't wait to see what story he tells us next.